PyCon Australia 2012 Programme – Out now! I’m very glad to be able to finally release PyCon Australia’s programme for this year. It’s one of the strongest programmes we’ve put together for this conference, and it features excellent content for developers in all aspects of the Python Ecosystem. The Lazy Dev’s Guide to Testing Your Web API by Ryan Kelly — Ryan’s an excellent presenter, and his talks always show off crazily cool stuff that you just shouldn’t expect Python to be able to do. Virtual robotic car racing with Python and TORCS by Tennessee Leeuwenburg — AI-driven race cars? What’s not to like? Path Dependent Development: Why on Earth are you using SQL Alchemy as a JSON validator? by Nick Coghlan — I admit, the title’s what’s piqued my curiosity. And I really want to know why they ended up validating JSON that way. Of course, there’s more than 30 other talks, including our keynote presenters, Mark Ramm (who’ll be showing us why Python’s strengths in handling scientific data make Python an excellent tool for helping make product design decisions), and Kenneth Reitz (who’ll be explaining how to make APIs in Python better). There’ll also be our regular opportunities for lightning talks at the end of each day, and plenty of other activities. So why not check out the rest of the schedule and tell me what you’re looking forward to? 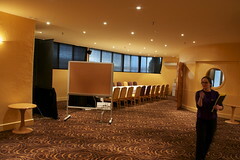 The PyCon Australia 2012 Venue Tour! It’s been a very busy month for PyCon Australia organisation — not only have we selected our programme for the conference (more on that real soon now), but we’ve also announced two keynote presenters, and made some real concrete choices about our conference venue. Since as presenters and delegates, you want to know about where you’ll be presenting, it’s probably worth showing off the venue to you. 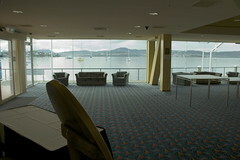 As we’ve mentioned countless times before, we’re holding the conference at the Wrest Point complex in Hobart. As well as being amazingly experienced operators of conferences, they’ve done a great job at being flexible to our needs — right down to a late venue change for us. 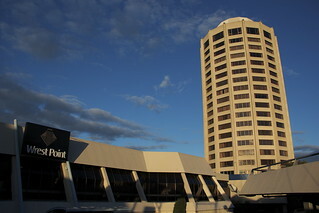 Locals, and people familiar with Hobart will probably be familiar with Wrest Point — it’s a very prominent tower building, right on the waterfront in Sandy Bay. Whilst there’s a quite prominent convention centre at Wrest Point, we’re forgoing that part of the complex in favour of something different. PyCon AU will be operating out of the Mezzanine section of the Wrest Point Hotel — a 1930s-era Art Deco building, which, whilst old, is amazingly well-kept, and very pretty. 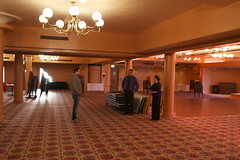 The Derwent Room is our primary venue – it’s an Art Deco ballroom, and in the configuration we’ll be using, will seat around 300 delegates comfortably. It’ll be set up as our keynote venue for the first and last sessions of each day; but during morning and afternoon tea, it splits into two halls — seating 200 in the larger of the two rooms (and more than 100 in the other). 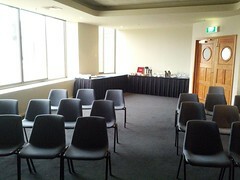 We’ll also be using the Derwent Room in an open-plan configuration (with couches, an open fireplace, and views of the Derwent River) for our post-conference sprints. The second piece of the puzzle — the room for our third stream of talks — is the Portlight Room. Located at the back of the Portlight Bar (just down the hallway from the Derwent Room), the room will be used for our extended tutorials, as well as some of our shorter talks. 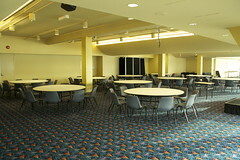 It’s recently been renovated to allow for more seats — we reckon it’ll seat more than 100 delegates comfortably. 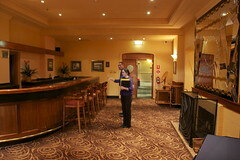 The Portlight Bar itself, complete with open fireplace, will be our haven for caffeine addicts — our Espresso Bar, sponsored by Secret Lab, will be pulling shots for delegates right throughout both conference days; you’ll also find a selection of other drinks at morning and afternoon tea time. This will also be where we put our conference registration desk. A great tech conference needs a great hallway track; and a good hallway track needs good hallways. Luckily, we have these too! 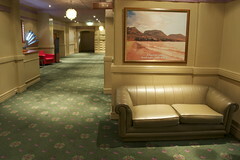 There’s ample couches and space to mingle with other delegates around the conference hallways. Finally, we’ve set aside a room for use as an open space — we’ll have couches, as well as desks available to let you hack and work on slides to your heart’s content. Or if you want to hold an impromptu talk, we’ll make sure that you can do this here too! The final venue to look at is the Boardwalk Gallery — it’s part of the convention centre section of Wrest Point, and it’ll be where we’re holding the CodeWars tournament (which, by the way, is now being sponsored by Kogan). It’s a large, open-plan space, with floor-to-ceiling windows looking out onto the Derwent river, which is less than 5 metres away. So that’s it — our venues for PyCon Australia. If you want to see the full set of venue photos, including plenty of extra angles from each of our conference spaces, you can find it on Flickr. Got any questions? Feel free to ask!